Take it right up the.... Well, you know. Oh, come on, I'm just kidding, we're all friends here! Listen, everyone's entitled to their opinion. And, without a doubt, I've witnessed my fair share of haters of the way the horror genre has been going with the likes of GET OUT -- and now A QUIET PLACE -- somehow 'commercializing' scares and not nearly being what the genre used to be back in the day. He did put in his two cents on the film, a movie with a current 97% average on Rotten Tomatoes. I know, I know -- ratings a good film doth not make, but still.... When it's straight-up horror, either someone ain't stirrin' the Kool-Aid correctly, or that's just a damn good horror film! 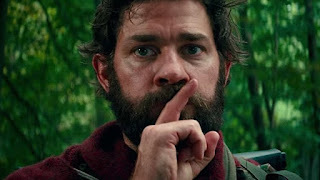 "A QUIET PLACE is an EXTRAORDINARY piece of work. Terrific acting, but the main thing is the SILENCE, and how it makes the camera's eye open wide in a way few movies manage." That's. From. 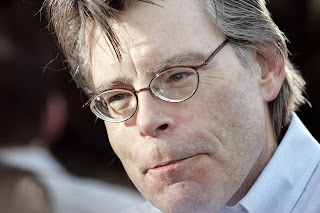 Stephen King. And the man's not exactly an outspoken cheerleader, if you know what I mean. Unless it happens to be about Donald Trump, and his outspoken-ness happens to be all negative. Harnessed a wicked $50MM. Not too shabby. Look, you may be a killer critic, and it'll take a lot to scare you. Truth be told, I personally don't get 'scared' when watching horror films or reading horror novels at all. But long story short, if the film's good regardless, I personally say that's all that matters. As long as the movie makes my wife want to hold onto my body parts, I'm all good.